Today's tattooed poet is Tameka Mullins, a poet who blogs at her site Lyric Fire. 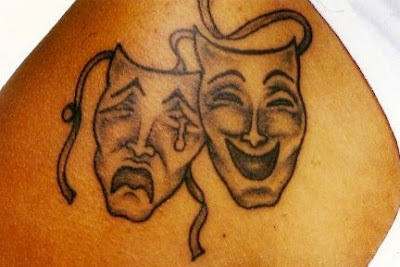 Tameka chose this tattoo design because she was a high school drama major and she dreamed of becoming an actress. The tragedy and comedy masks are a popular tattoo design, especially among creative individuals. They have even appeared on Tattoosday before, as seen here and here. I actually collected objects (paintings, art masks, etc...) with the thespian symbol over the years because I felt such a connection to the image. 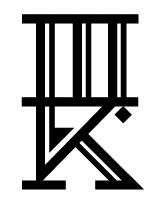 As I grew older I realized I loved the symbol so much because to me it summed up life. Happiness, sadness, joy, pain, elation and deflation. These are the emotions that drive us, crush us and propel us and are at the center of almost everything we do. As a writer I look to capture, explore and expand on these emotions in my projects. 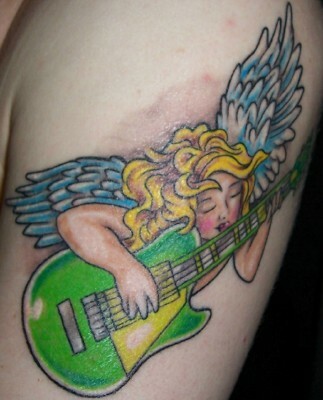 After a night out parting with her best friend, Tameka got an ear piercing and this tattoo at Sacred Tattoo in Manhattan. Tameka is a native Detroiter who loves writing, networking and cultivating great relationships. Her professional background includes work as a public relations professional, radio segment producer, project manager and consultant for publishing and non-profit organizations. She wrote her first poem when she was 5-years-old and it consisted of just two words: "I dream." She believes that with persistence and passion dreams can be transformed into goals which become reality. Her novel Letters to Chyna, which delves into the emotionally charged issues of adoption is currently being reviewed and considered for publication. Wow Tameka Mullins, Your tattoo design is really fantastic. With just two masks you are saying all reality of life of human being in the world. I went to high school Tameka. She was my best friend. She is my sister. At least she was in high school. In many ways she saved my life and taught me to own my passions. We did drama together and she is a very talented woman. Tameka (Christopher), I am so happy to see you living your dreams you always dreamed of being an actress but you also loved to write and reach out to people using your talent and gifts. I miss you. Wow! Something told me to click on this article today and I'm not sure why. RUTHIE! To see that you posted here brings tears to my eyes. Yes, you were my best friend. Just as much as you taught me, I learned from you. You are my sister. Sometimes as life carries us forward, we can grow distant, or lose touch, but one never forgets the imprint a friend makes on your heart. I miss you too and hope life is blessing you with all you desire and more. Perhaps one day we can reconnect. Your a women for all seasons Tameka. So much talent in so many areas!!! Love the design and love that it helped you connect with an old friend! !